I had driven by this small park many times going to other areas further to the east. It does not have a lot of trail mileage or other interests that would draw me from Nashville. I was going to Cumberland Mountain Park that morning so I thought I would stop by in the afternoon and check it out. 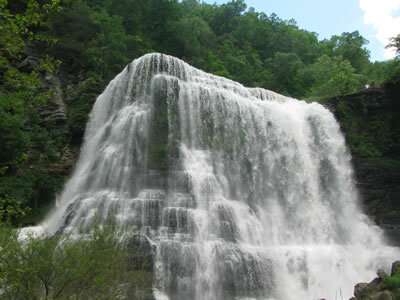 Directions: From exit #286 on I-40 (Cookeville) go south on Hwy 135 for about eight miles to the Park. After crossing the Burgess Falls Lake the road tees. Turn right, go a short distance, the first parking area is for overflow parking and the Dam Overlook. Further down the hill is the main parking area. 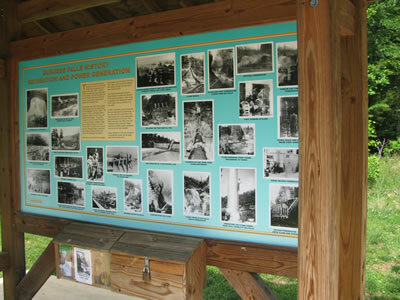 An information kiosk is located at the far right side of the parking area. 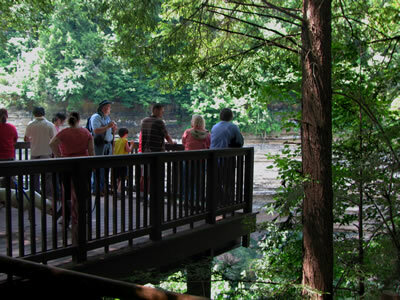 From the information kiosk, walk past the shelter (with restrooms) to the river. 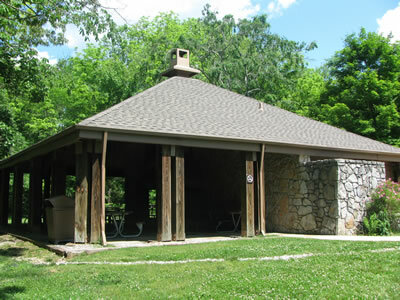 There is a sign near the corner of the parking lot (past the shelter) that indicates the trailhead for the River Trail. 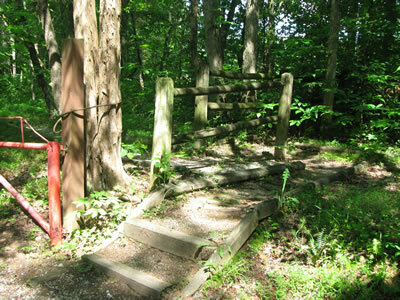 There are other trail access points which can also be used, so if you do not start at the sign, it will be fine. 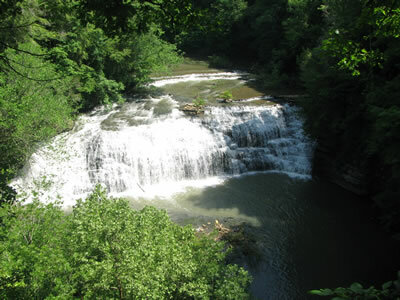 The upper or first falls is just a couple of hundred feet down the path (depending on where you start). 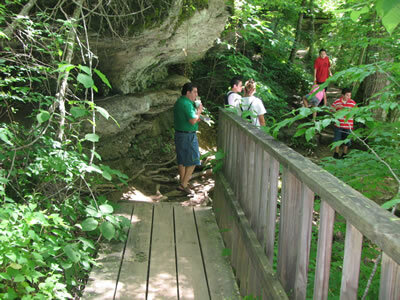 As the trail continues it follows the river it passes over several bridges. 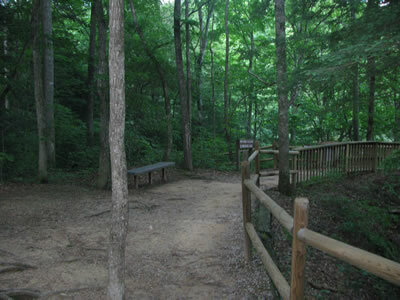 After .35 miles the trail crosses the final bridge and begins climbing to the Middle Falls Overlook. 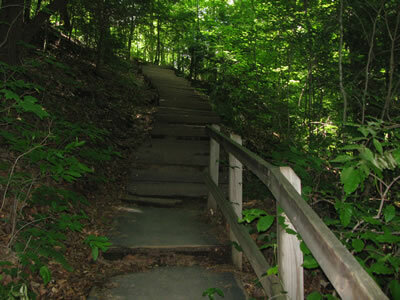 The stairs are steeper than other sections of the trail. At the top of the stairs continue to the Overlook spur. 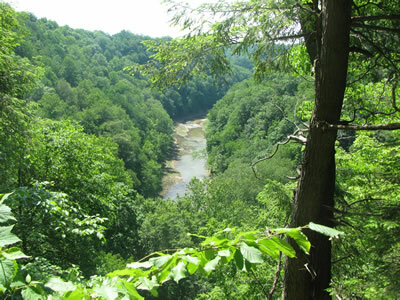 It is definitely worth the short side trip to the Middle Falls Overlook. The Overlook is .50 miles for the trailhead. Leaving the Middle Falls it is an almost level hike to the Big Falls Overlook and the end of the River Trail. 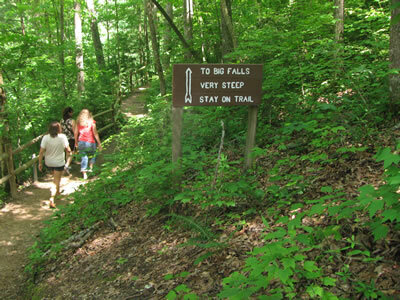 From the Big Falls Overlook there are a few options for continuing the hike. 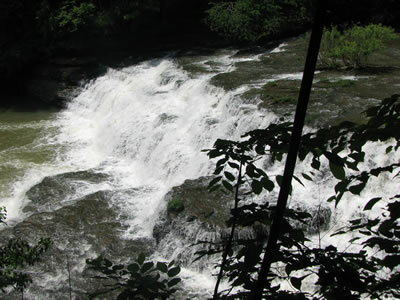 The first is descending to the top or base of the Big Falls. 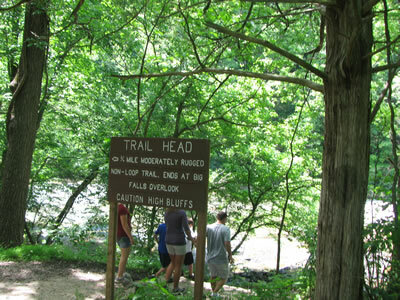 A graded trail descends to the top of the Falls in .10 miles. Use care near the high cliffs and water. This is not a place for horseplay. 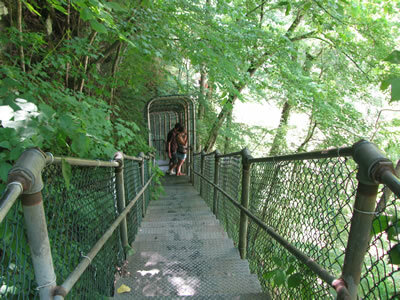 From the top of the Falls a long, steep, caged stairway leads to the bottom of the Falls. Leaving the stairs a rough trail continues to the water's edge. 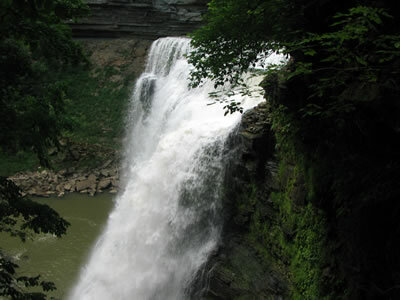 The Big Falls is big. 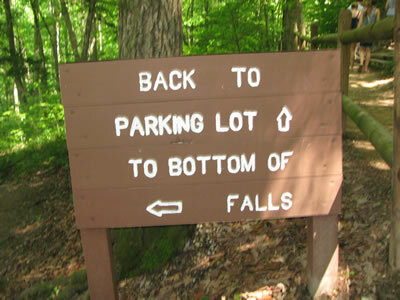 It is .25 miles one way to the base of the falls and it is rated as difficult. Returning to the Big Falls Overlook the hiker may return to the trailhead by reversing the River Trail; but most hikers seem to prefer to return on the gravel road. Leaving the Big Overlook a junction directing hikers to the Parking Area leads to the gravel road. From the Big Overlook it is .70 miles on the gravel road to the Parking Area. The road is not particularly scenic, but it is easy walking. At the start (or end) of the gravel road is another sign directing toward the Ridgetop Trail. The trail adds .20 to the gravel road. 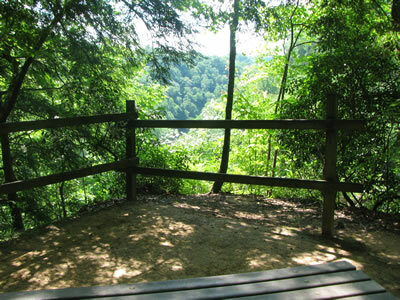 At about .10 of a mile on the Ridgetop Trail there is a bench located at a great overlook. The trail continues to wander over the easy terrain searching for gorge views and returning to the gravel road after .20 miles. From where the Ridgetop Trail rejoins the gravel road it is .60 miles to the Parking Area.